Civil Rights Defenders continues to grow rapidly and has used this momentum to intensify our work around the world. In the 2017 edition of Time to Act, we draw attention to the challenges and risks that human rights defenders face in some of the most repressive regions in the world. The magazine also highlights some of Civil Rights Defenders’ significant achievements in the recent history. Read about our initiatives to support Cuban human rights defenders through creating a unique database that helps organisations to safely upload and store vital information about human rights violations. Through the programme Detained – But Not Without Rights, now in its second consecutive year, Civil Rights Defenders monitors the situation for people deprived of their liberty in closed institutions in Sweden. In Eurasia, lawyers are often at the forefront of human rights defence. As part of our larger programme of support for human rights lawyers, Civil Rights Defenders recently conducted joint training for lawyers from Azerbaijan and Belarus. Civil Rights Defenders strongly believes in the importance of educating the next generation of human rights defenders and human rights lawyers. Read more about our initiatives in the Western Balkans. In Southeast Asia, hundreds of human rights defenders have been arbitrarily detained, including the recipient of the Civil Rights Defender of the Year Award 2015 – Me Nam. Civil Rights Defenders continuously campaigns for her release as well as for the Vietnamese government to ensure full respect for civil and political rights. Understanding existing laws is one of the first steps towards defending and promoting human rights. That is why Civil Rights Defenders has collaborated with the Ugandan human rights organisation Unwanted Witness to compile a comprehensive analysis on cyber laws in Uganda. 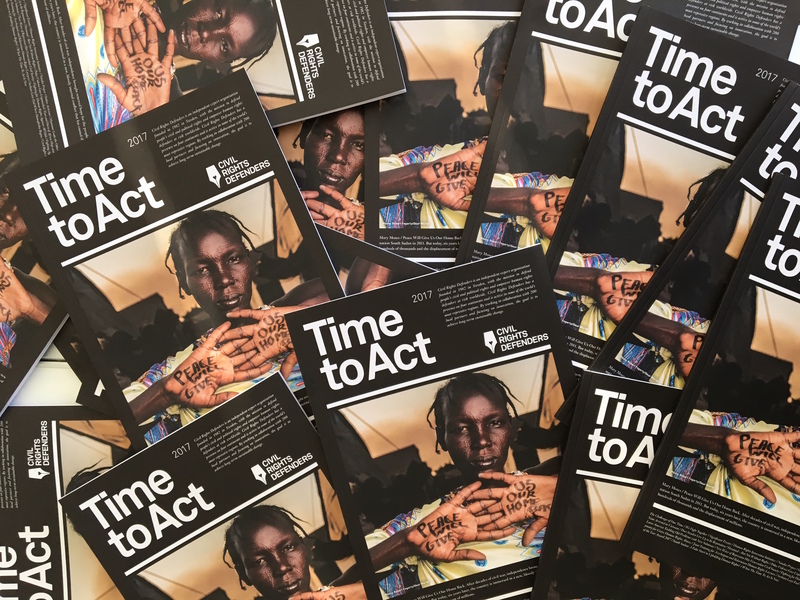 Download the full edition of Time to Act 2017.